We are taught at a young age that safety should always be a priority. Whether it is wearing a seat belt, protecting your head with a helmet or looking both ways before crossing the street; the subject of safety seems to be a part of our everyday lives. Let’s discuss the overall safety of those who ride motorcycles and this video highlights what you need in order to dress for the slide, not the ride. Everyone knows the importance of helmets, but let’s review the rest of your body and the need to dress appropriately from helmet to boot. Even though we frequently sue Allstate, this article does provide a great outline for what to wear to keep you safe while riding. 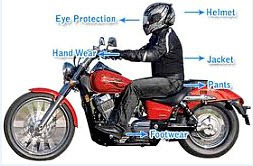 No matter where you’re riding, or how long your trip might be, the proper safety gear could save your life in the event of a motorcycle accident.